Here’s a bit of comic and Disney history we picked up from Fantagraphics Books. 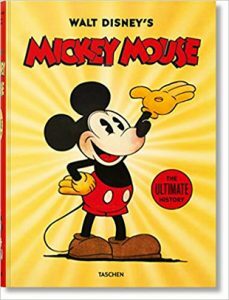 “When Disney Legend Floyd Gottfredson stopped creating new Mickey Mouse adventures in 1955, Italian Disney maestro Romano Scarpa (1927–2005) picked up the Mickey mantle — and he quickly proved himself a worthy successor, spinning out decades’ worth of new Mickey action epics — most of which have never been available in English! Now Fantagraphics is translating and anthologizing Scarpa’s best! 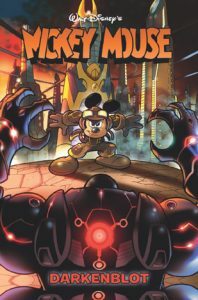 This volume also reunites Mickey, Atomo, and Pete for Scarpa’s ‘The Bleep-Bleep 15’ and ‘The Fabulous Kingdom of Shan-Grilla,’ two internationally famous tales making their North American debut!” Disney Masters Vol. 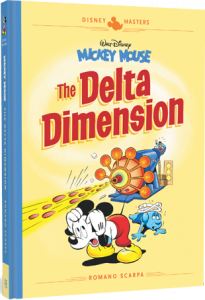 1 Walt Disney’s Mickey Mouse: The Delta Dimension is available now. Mickey Mouse in Hell? Seriously? We could not make this stuff up if we wanted to, folks. 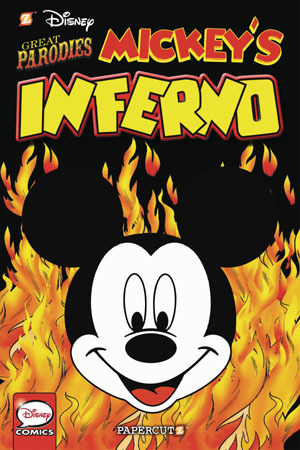 Mickey’s Inferno. 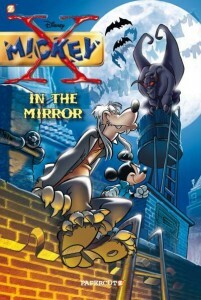 Yes: The scary portion of Dante’s Divine Comedy as re-told in full-color graphic novel format by Mickey and his friends. And Papercutz got Disney’s okay with this! It’s written by Guido Martina (who is a well-known creator of Disney material in Italy), illustrated by Angelo Bioletta, and available in softcover and hardcover editions — on the shelves right now. Gosh, is Purgatory next? 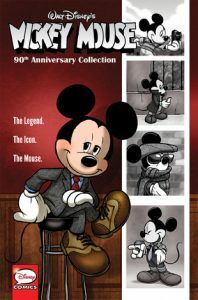 Mysterious Melody, or How Mickey Met Minnie is a brand new take on the world’s most famous mouse, once again brought to us by IDW. “What was life like for Mickey before 1928… before Hollywood stardom struck? 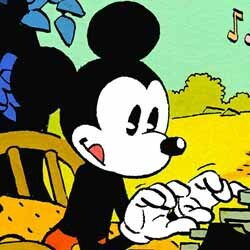 In this riveting, phantasmagorical ‘what-if” tale, we follow the Mouse from his humble origins – as Oswald Rabbit’s screenwriter! – through a tangled web of trains, rocket ships, and stolen Shakespeare scripts! Will a haunting tune bring Mickey and Minnie together for the first time? Will Goofy find success as a… ferryboat driver? Or will big boss Mr. Casey and relentless Peg-leg Pete strike again? Award-winning Swiss cartoonist Bernard Cosey (Lost in the Alps) brings us an amazing Mouse adventure with a thoughtful, emotive twist.” According to Previews, it’s coming our way in full color and hardcover this December. Gosh! 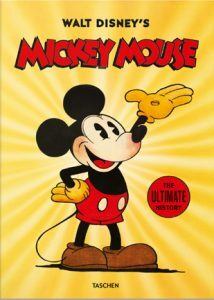 By now you have likely heard about the Mickey Mouse Shorts TV series — truly mad little animated cartoons brought to us by Paul Rudish and his crazy crew. 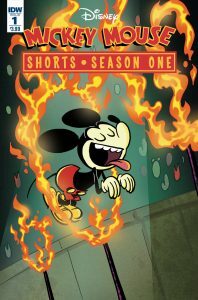 Well now IDW Comics have been tasked with bringing us comic book adaptations of several of the Shorts, which they have done with the new Mickey Mouse Shorts: Season One full-color miniseries. “Join Mickey, Minnie, and all their pals in a comic adaptation of the celebrated, multi-Emmy and Annie Award-winning shorts from Disney Television Animation! In this issue, Mickey battles his way through a Tokyo bullet train during rush hour, an unlikely character competes in a dog show, and Donald suffers from….Flipperboobootosis?! And that’s just the start!” Adapted by Scott Tipton and featuring a variety of artists, the series is available now — and you can read all about it over at IDW’s web site.